If you're looking for a delicious recipe for tonight's dinner, then you've come to the right place. We've collected our best pasta casserole recipes, so you'll have plenty of options when you're trying to decide what to make. Depending on what you're in the mood for, you can choose between our chicken casseroles, our ground turkey casseroles, or our vegetarian casseroles. No matter which pasta casserole you decide to make, you can be sure that it'll be a hit with your family. Everyone will want to go back for seconds and thirds of these yummy pasta dishes. So, grab your favorite casserole dish and pick a recipe to make tonight. You definitely won't regret it. These pasta casserole recipes will soon become your go-to family dinner recipes. Want even more casserole recipes? Check out these 41 Heart Healthy Casserole Recipes. These chicken pasta casseroles are absolutely, without a doubt, amazing. Every bite will leave you wanting more. If you can restrain yourself from eating the entire casserole in one sitting, then you'll be able to enjoy this dish the next day. Don't worry, the leftovers will be just as tasty. These vegetarian casseroles are filled with your favorite veggies and yummy pastas. All of the fresh ingredients come together to create amazingly healthy dishes. Even if you're not a vegetarian, you will love these vegetarian casserole recipes. So, you should make one of these simple healthy recipes for tonight's dinner. We have so much more to show you! Check out these 11 Easy Soup and Stew Recipes. These ground turkey casseroles will leave you jumping for joy. You'll love how the flavors all come together to create a perfect casserole 100 percent of the time. 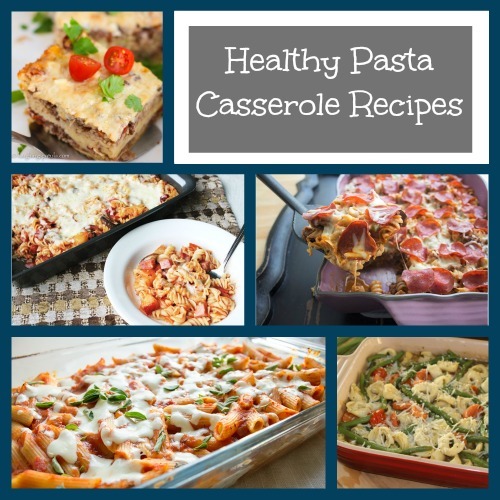 Plus, you can be sure that these pasta casserole recipes will be healthy because they use ground turkey instead of ground beef. We couldn't leave out these stupendous pasta casserole recipes. Between the Healthy Pizza Casserole and the Skinny Beef Casserole, it'll be hard to decide which healthy recipe to try first. We recommend that you try them all.